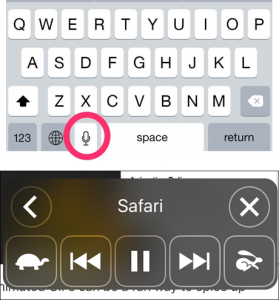 There is the option to dictate into any app that brings up the default keyboard, which may help learners whose spoken language is better than their written. To do this, click the microphone icon to the left of the space bar on the keyboard. (N.B. Only available when online). In the Settings app there are a number of accessibility options. Go to General > Accessibility > Speech and turn on Speak Screen and Speak Selection. Now when you are in an app with a lot of text to read, or using the browser to access a web page, swipe down from the top of the screen with 2 fingers. The iPad will read the contents of the page. Alternatively, highlight text in an app and choose Speak in the menu that appears above it. Use the toolbar to slow down or speed up the speech (see image right). Open a Google Doc, and go to the Tools menu. Click on Voice Typing and you can then record your voice and it will convert it to text. Type or paste in some content into a Google Doc, then go to Tools > Explore. A window will open on the right-hand side, containing links to a search about the information contained in the document and some suggested images. This is a great tool for all students, but may help EAL learners as it identifies the keywords for them. Highlight a word in a Google Doc, then go to Tools > Dictionary to bring up a dictionary definition in a window on the right. Finally in the Tools menu there is the option to Translate document. 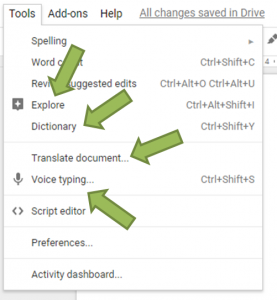 Use this to create a new version of the document translated into one of 100+ languages available via Google Translate. See also Jake Miller’s blog post on how to use a formula in Google Sheets to quickly translate word list – it’s amazingly quick and easy if you are happy with adding formulae in spreadsheets. The tools that are available depend on the version of Office you have access to. 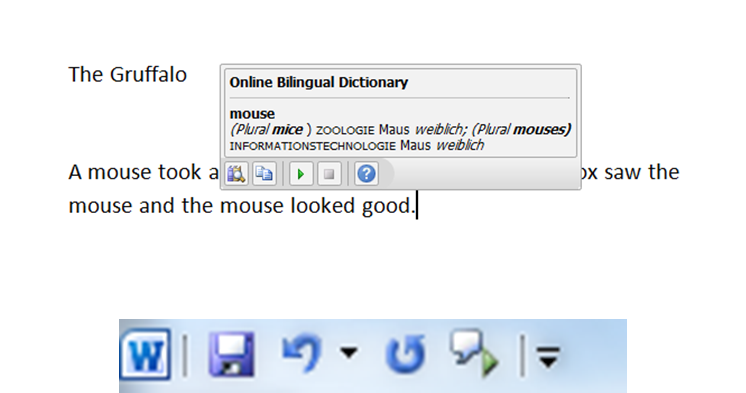 In Word and PowerPoint 2010 and newer versions there are various translation options via the Review toolbar > Translate. You can translate the whole document, a selection, or use the Mini Translator to provide a translation when you hover over a word. This last option also allows you to hear the word being pronounced. You can also add the option to Speak selected text to the Quick Access Toolbar (at the top of the page, above the ribbon). To do this, click on the downward arrow at the right-hand side of the quick access toolbar. Choose More Commands. In the window that opens, change the option under Choose commands from to All commands. Scroll down the list and select Speak and click Add then OK. 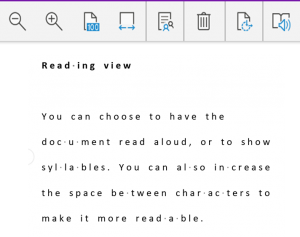 If you are lucky enough to be using the latest version of Microsoft Office, there is a fantastic tool in One Note 2016 called Immersive Reader. 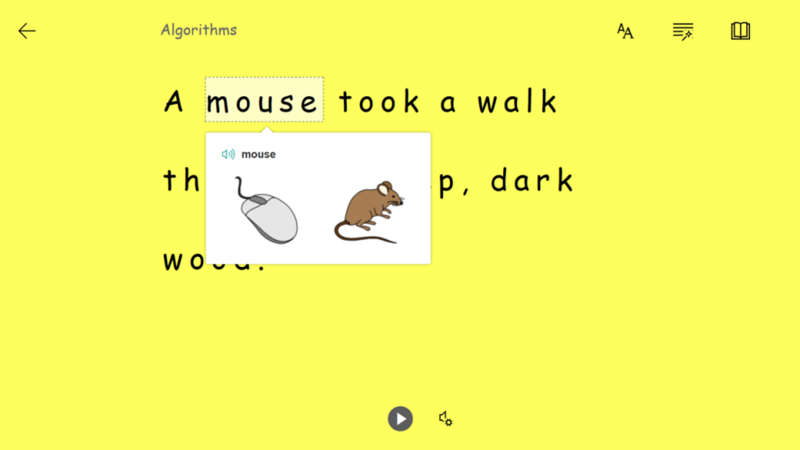 One Note can be used by students to take notes, or for teachers to create a class notebook to share content. Add some text to a page in One Note, then click on the Immersive Reader icon (see image right). This displays the text in full screen, reducing clutter and providing a number of options to increase the size of text or change the colour of the background – all great for supporting learners with special educational needs. You can then also click the play button at the bottom of the page to hear the text spoken. In the tools, there is the option to highlight the parts of speech in different colours (e.g. nouns, verbs, adjectives), plus there is an inbuilt picture dictonary – just hover over a word to access this. For more information on these tools see https://www.microsoft.com/en-us/education/products/learning-tools/default.aspx.